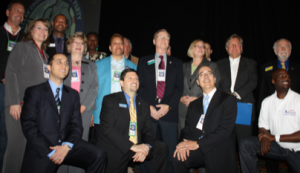 The Democratic Party’s movers and shakers convened at the Riviera Hotel & Casino on Saturday, April 14, 2012, for the Clark County Democratic Convention. As I walked toward the swarm of busy attendees entering and exiting the main convention hive, I noticed an extremely loud buzz of its attendees’ voices in the room’s stratosphere. My initial instinct was to tune it out as the sound was chaotic and quite disturbing. Taking a moment to adjust, I let myself be drawn in by it instead. As I came into tantric unison with the hum of the many attendees’ voices, I wondered what I would discover to be the group’s collective mantra. What would be the most prominent cohesive ideal which brings such a diverse group of citizens together to be called the Clark County Democratic Caucus? I came upon one of the convention attendees, Frank Slaughter. My question to this ex-Marine Corps soldier and father was simple. What did he consider to be the Democratic Party’s single most important foundational goal? With a broad smile, he responded, “Basically, the Democratic party is for everybody. It is inclusive, not exclusive. The Democratic party means equality for everyone, especially the working class.” After hearing Mr. Slaughter’s very eloquent words in support of his party, I wondered if other attendees and candidates would share his view. Desiring to see if Mr. Slaughter’s perception was also on the minds of the party’s candidates, I sought out Felipe Rodriquez who is currently running for State Assembly for District 19. I presented the same question. Mr. Rodriguez responded, “We may have different personal beliefs. We may have different personal values here and there. But, at the end of the day, the Democratic Party’s common goal or theme is the representation of the working class of America. It is the common man or the working class of America who has sustained this country and made this country into what it is today.” Mr. Rodriguez’ platform is one which supports the working class of Americans and their children. He desires to bring jobs back to Nevadans and to oppose legislature that will rob our educational system of money necessary to support Nevada’s teachers. Felipe Rodriguez can be found at http://felipe4assembly.com . I was already hearing a whisper of the party’s mantra. I continued through the crowd and happened upon a gentleman named Michael Hopper. I was taken aback by his rather simple, yet articulate response to my question. Very seriously, without skipping a beat, Mr. Hopper responded, “Our mission is to improve this country.” The United States Veteran continued, “I’m watching the war on women, the war on the underprivileged. I am watching the war on everyone who does not have a voice. These people here are united in providing a platform to give a voice to underprivileged and all those who are voiceless in fighting the oligarchy in corporate America that is ruining our country.” Defying the victimization of the voiceless, Mr. Hopper’s words reverberated through my head. His concern for the voiceless and underprivileged in America rang loud and clear. Mr. Hopper then directed my attention and made a short introduction to the Nevada State Democratic Party Chair, Sam Lieberman. Mr. Lieberman has continued his work as the party’s chair since winning his election in 2009 and had a few words to say on the topic of the day. Mr. Lieberman spoke of the “diversity” of the political figures that is representative of the party. He commented that he believes that diversity within the party is necessary. “I think that all of these candidates represent the diversity that is our party and needs to be. I believe it is a combination of education and economy that will bring voters out to the polls regardless of the candidates’ backgrounds.” Mr. Lieberman can be found on Facebook at http://www.facebook.com/people/Sam Lieberman/648402342. One candidate who offers such diversity is Steven Brooks, currently jockeying for a re-election to the Nevada State Assembly, representing District 17. Steven Brooks also believes the main focal point for the Democratic Party is a platform built on remedying the country’s education and unemployment issues: “We have to bring jobs back to the state of Nevada. In order to do that, we have to rectify our educational system. Our educational system is failing us and as a result, no businesses or companies will relocate to the state of Nevada until we can fix that problem. We must dismantle Nevada’s educational system as we know it and put it back together again in a format that is functioning appropriately. It is incumbent upon us in the State Legislature to make sure our teachers have the support that is necessary for them to excel in the classroom.” Keep up with Mr. Brooks at http://brooks4assembly.com. Congressional Candidate Dina Titus was my next interviewee. Addressing the great divide between what the Republicans and Democrats will bring to office, Ms. Titus wished to point out … “regardless of the Democratic candidate, we are all here united behind basic Democratic principles which all stem down to making the economy better, and making it better for all people, not just for the few at the top.” Discover more about Dina Titus’ campaign at www.DinaTitus.com. The unanimous theme which presented itself at the Clark County Democratic Convention is one of hope for the people of Nevada. The Democratic Party speaks to the “common man” in us all … the average, blue-collar, working-his-fingers-to-the-bone American. To summarize in one sentence: The Clark County Democratic Party is the party representing Nevada’s working class, hoping to achieve security in employment and a strengthened economy for the entire Nevada populace … even for its Republicans. 3 Responses to "The Common Man’s Party"
Is this the same Dr. Stephen Frye who went to a fellowship with African-American pastors, invited by The Urban Voice magazine, that stood there telling these pastors, who mostly do work in the worst neighborhoods, that legalizing ALL drugs was the best course of action? Is that the one you are saying is a great Democrat leader? If it is, no thank you. And, would the democrats PLEASE stop blaming Bush. It has been a long time since he has been in the white house and BO hasn’t done anything for us except put us into more debt. If these are the examples of democrats at work, it is time for them to be fired. Thank you, Marla! I really did research Sam Lieberman terms in office. Will correct it before we go to print. Thanks for the heads up!! All true. But one correction: Sam Lieberman is the former chair of the Nevada State Democratic Party. Roberta Lange is the current chair and was elected to that position 13 months ago.